Juan Mata is on the verge of joining Chelsea from Valencia for a fee of €27m (£23.5m). Mata spoke to André Villas-Boas during the day and the Chelsea manager explained the role he has in mind for the attacking midfielder. The 23-year-old, who has studied at university and speaks reasonable English, has long been open to a move to the Premier League. His father and agent, also Juan Manuel Mata, had spoken to a number of clubs in England. 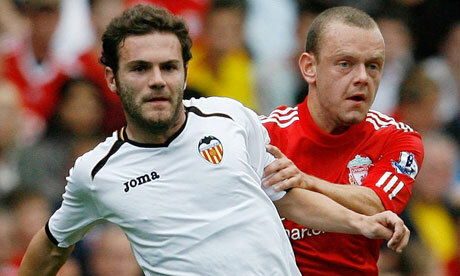 Mata’s initial preference was to secure a move to Barcelona but he was in no hurry to depart Valencia. The signings of Alexis Sánchez and Cesc Fábregas by Barcelona finally ended any possibility of a transfer to the Camp Nou. Mata had already turned down the opportunity to join Tottenham Hotspur at the end of July. Tottenham sought to take advantage of a clause in Mata’s contract that allowed him to leave the club before 31 July for a set fee of €25m: had Valencia unilaterally blocked a move at that stage, they would have been forced to increase Mata’s salary. The player, though, did not want to move to Spurs. Liverpool had previously shown an interest in the player but opted in the end to buy Stewart Downing from Aston Villa, with Kenny Dalglish putting a premium on players with Premier League experience. Despite showing an interest and although Mata’s camp was open to the idea of a move to the Emirates, Arsenal failed to make a formal bid during that window of opportunity in July. Now Chelsea have done so. Valencia were not keen to sell one of their key players and believe that, although their financial situation remains difficult, they were not obliged to sell. They had also hoped to avoid a situation in which they lost the midfielder close to the start of the season but replacements had already been signed in the shape of Sergio Canales and Pablo Piatti and they had set a figure of €30m at which they could be persuaded, given that the July release clause would come into effect again next season. Mata’s desire to accept the offer to move to west London finally helped to bring the two clubs to an agreement which is being finalised.